Love is everywhere this year - Valentine's Day, the movie, is opening and Scenterprises' Custom Perfume Experience: "Heart-to-Heart" for Haiti - A Relief Effort is taking place on Valentine's Day, Sunday, February 14, from 11:30 AM to 3:00 PM. A few spots are still open for this fabulous Custom Perfume Seminar. You will learn about the magic and mysteries of Aromas. Fragrance Expert, Sue Phillips, who developed TIFFANY's Perfume, fragrances for BURBERRY'S, TRISH McEVOY and many others, will take you on a 'Fragrance Journey' to discover 18 exquisite blends. You select the 3 or 4 that you love and those become your unique 'formula'! You name your fragrance and receive a Certificate of Registration. We decant your custom formula into an elegant designer atomizer while you enjoy a lovely brunch. This is an ideal experience for men and women to share their love with those in need. This year we've included a special auction where 100% of the proceeds will benefit American Red Cross Haitian Earthquake Relief. There will be a wonderful selection of items from LANCÔME, OSCAR DE LA RENTA, EMPIRE DIAMOND, FELLAN FLORIST, DR. FRAN GARE, DR. MICHAEL GELB, Artists HUNT SLONEM & MICHAEL MUT, THE PERFUME STUDIO and many, many more. 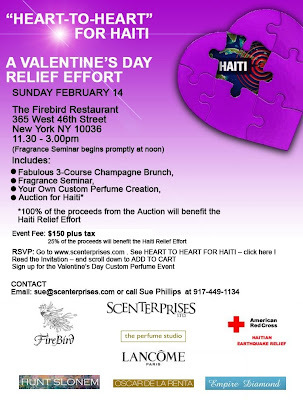 LET YOUR LOVE REALLY COUNT THIS YEAR, support Haiti Relief with a one-of-a-kind, innovative, multi-sensory experience. The event includes a fantastic 3-course brunch with a glass of champagne at renowned FIREBIRD Restaurant, 365 W. 46th Street, NYC, the Fragrance Seminar with International Fragrance Expert, Sue Phillips, and the opportunity to create your signature scent. The event fee of $150.00 plus tax includes gratuity and 25% of event fee proceeds will also be contributed to the Haiti Relief effort. Just think . . . Celebrating Valentine's Day will help SOOOOOOO many people who are in dire need of love and support . . . let alone food, supplies and shelter! Statuesque and chic, I am fashion forward, creative and imaginative. My cosmetic craving dates back to childhood and my accessory addiction all started with a pink pocketbook in preschool. Since I spend hours on the phone exchanging beauty tips with friends, my husband suggested that I start a beauty blog to share with everyone. With his encouragement, "The Vanity Addiction," was born. Take a seat with me at the vanity table and indulge as I share a little bit about the vibrant array of beauty products in view. Subscribe To "The Vanity Addiction"